I have to say that those only have a passing resemblance to the Schnerk font to me. Many thanks, Ian and Piers. That's a marvellous job to print the cover by hand. The film posters for Stewart Kirby and Damita Syn seem to use the same lettering. You're right, Ian. The cover and the posters were clearly hand drawn so your facsimile is the best approach. That Brocklin font is the basis of hundreds of other fonts dating from 1914 onwards so picking the exact one would take a while. Similar font used for the Pandora titles, of course. It wasn't the easiest job I must admit. It took me ages to even attempt the text on the script. After hand painting the design on the cover the thought of having to do the text was unnerving, one mistake or misalignment and the whole project would have been ruined. You couldn't exactly rub out a mistake and start again. Not a prop I'd attempt to repeat. What I found most interesting about that cover was the EMMA PEEL lettering. All the text was hand painted in the same style of font on the cover, yet Emma Peel was very roughly block drawn on with some sort of thick marker pen. I wondered why they went to all the trouble of careful hand painting all the lettering in fancy font yet so harshly wrote Emma Peel in such basic fashion ?? I can answer that - the idea was that the script was written before they had chose (or 'cast') their lead, so Emma's name is written in once they had chosen their victim. 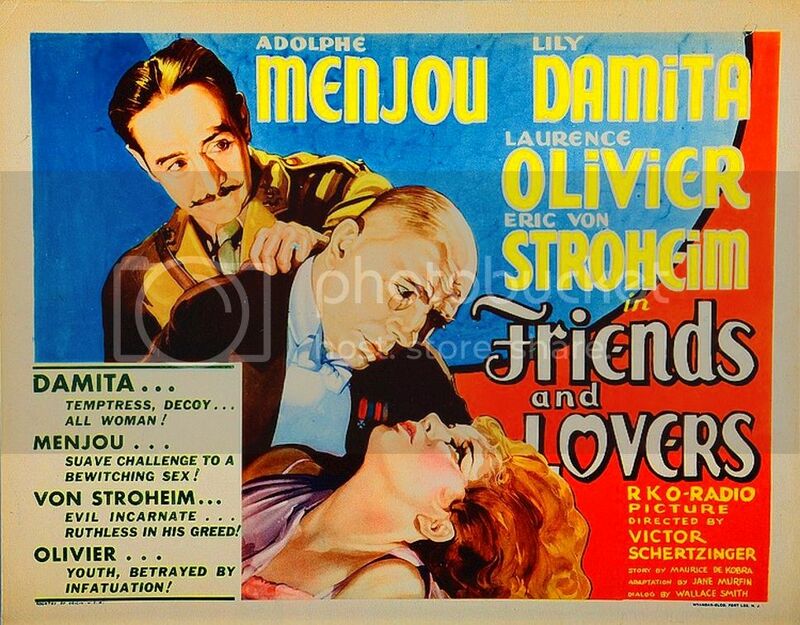 Just found this 1931 movie-poster art-work Friends and Lovers with Adolfe Menjou, Eric Von Stroheim, Lily Damita and Laurence Olivier directed by Victor Schertzinger. and director Schertzinger were the inspiration for the character of ZZ von Schnerk - and Lily Damita re-named Damita Syn? An early version of ZZ von Schnerk and Emma Peel? Brilliant. While I have to admit in not seeing any real similarity in the lettering myself, it certainly does looks like this may have been the inspiration for EPIC, great find. From the opening scene of FOG when it drops to the cobbled street. ... And the framed versions seen hanging on the walls in the various homes of the club members. I'm so glad you've started making these again, great work as always! Thank you Piers. I haven't as such, I was home ill last week and happened to put FOG on just to to pass an hour, the main heading fonts on the leaflet caught my eye and I thought they would be a bit of a challenge to recreate, I had to paint them by hand. I think I got it pretty close. I think the Ripper museum set was one one of the best and most atmospheric the production ever created. Next step, cut these paper templates out of 3mm hard plastic sheet. Bonded all the plastic pieces together with impact adhesive and fibre glassed the inside for extra strength. Now it needs to have the retaining screws removed, all the joints filled and then a trip to the sander. I'm thinking of making the Gas Lamp controller too, so that I will have recreated the pair as seen in the episode, but we'll see. Yep decided on making both, and why not ! Here they are in various stages of being built. I've had to order the chrome On/Off buttons from China as it's the only place I could locate them. Sadly it means it could be a few weeks while I wait for them to arrive before I can finish these. In the meantime I noticed this yesterday in 'Get-A-Way', similar construction and texture to the controllers, so, as I've got some materials left over, I'll have a bash at this, and the Lizard Vodka bottle. Just waiting on the chrome on/off buttons and then these are completed. Completed the basic plastic structure for the Get-A-Way prison cell viewer this morning. After it's really set firm I can start to fill and shape it. Odd that these weren't placed at eye level ? ?